About Us Welcome to Windfall Puppies! I am located in Aiken SC. 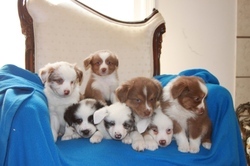 I raise beautiful Mini/Toy Australian Shepherds and Mini/Toy Aussie Doodles pups! I have grown up with family dogs and dogs have always been an essential part to my life. I grew up with German Shepherds and used to breed and show them in MA with my father. 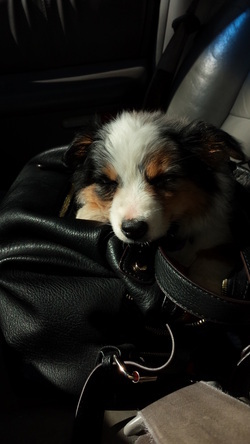 When I moved to SC I met the Toy Aussie breed and fell in love with them. The Toy Aussies are an intelligent breed. They are easy to train and are amazing companions. An Aussie needs little grooming and are average shedders, but Toy Australian Shepherds may not make an ideal family pet for some due to allergies, excess shedding, etc. On the other hand Toy Aussie Doodles are hypoallergenic, low to no-shedding and come in a variety of colors to choose from they make wonderful family pets! My puppies are family raised, have beautiful confirmation and have very sweet and loving dispositions. My puppies are bred for temperament to make wonderful family pets. I believe it's very important to take the time to choose the right puppy for you and your family so I offer visit times to help find a good match for you and your family. All puppies are vet checked, have their first set of shots and are up to date on their de-worming before they go to their loving homes.